Crochet Popcorn Baby Bonnet – I have written this pattern to match my popcorn baby coat it makes a really sweet set, hope you enjoy. 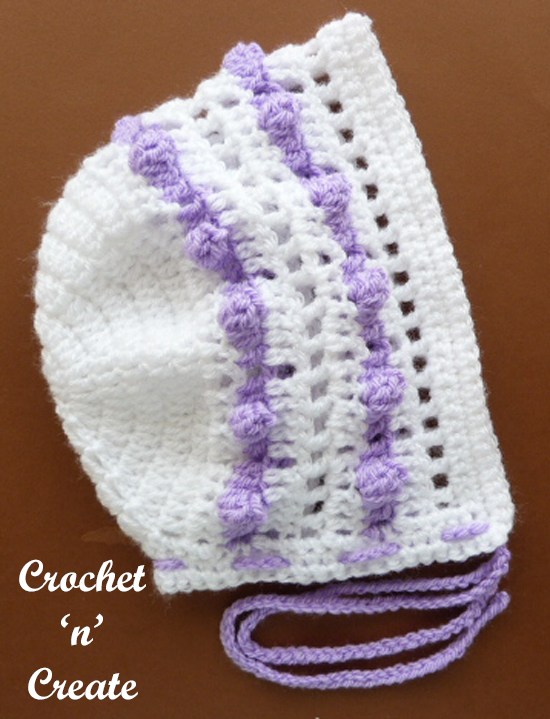 It is crocheted in rounds from the crown outwards using a light worsted yarn. Work 5dc in next dc, drop loop from hook, insert hook from front to back in the first dc of the 5dc of group, pick up and pull dropped loop through stitch. Row 6 – ch3, 1dc in each of next 66dc, turn leaving 3dc un-worked. Pattern Row 4 – ch3, * 1dc in next 5st, ch1, skip ch1 space, * rpt from * to * to last 5st and 3tch, 1dc in each of last 5st, 1dc in top of ch3. Fasten off. Turn. Rpt Pattern Rows 1 to 3. Turn. Border – ch1, 1sc in base of ch1, work 1sc in each st to end, 3sc in top of 3tch, work 37sc evenly in row ends along neck edge, 1sc in corner, sl st to first sc. Turn. Next Row – ch1, 1sc in base of ch1, 1sc in each sc along 3sc in the corner, 1sc in each sc along, 1sc in corner, sl st to first sc. Turn. Rpt last row once. Fasten off. Chain Tie – With color 2, ch150. Fasten off. Finishing – Weave in and trim off any loose ends of yarn, thread chain tie through sc on neck edge. 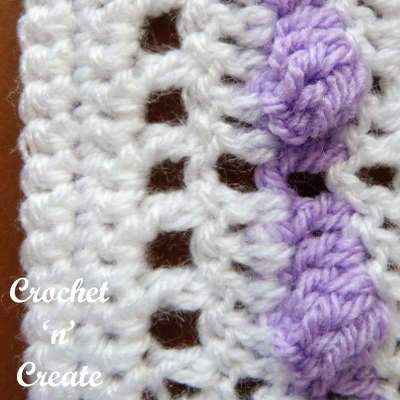 Speak to you soon with more FREE baby crochet patterns. The written instructions and pictures for the crochet popcorn baby bonnet pattern are copyrighted to crochet ‘n’ create © 2018. You are welcome to sell the finished products made from the free crochet popcorn baby pattern, I just ask that you please use your own pictures and put a link back to crochet ‘n’ create. DO NOT share the written instructions for the crochet popcorn baby bonnet pattern. 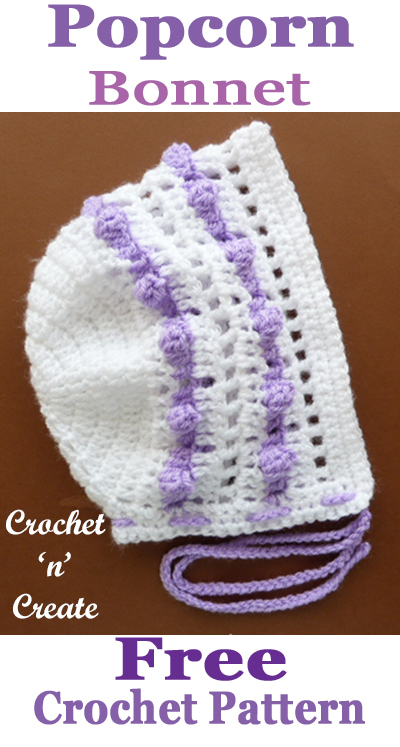 This entry was posted in Baby crochet pattern and tagged baby crochet patterns, crochet, crochet baby bonnet, crochet hats on 14th July 2018 by crochetncreate.